The better name of the YouTube channel, the more people will be able to find Your channels and videos. If you want to make your YouTube channel, then this time is to choose a good name and username. Here I have 10 tips for choosing a better name for the YouTube channel. By following you, you can choose a good name. Choose a name for your channel that targets your video category and your work and people can easily remember it. Also, choose the easy to type name that the viewer can easily type. Unfortunately, there are millions of users on YouTube and many of them have many channels, you have to be a star in the crowd of these channels. If you choose the bad name of your channel, it is very difficult to top it all. If you want to get on the top of the YouTube then you will have to pick the better name for your channel. 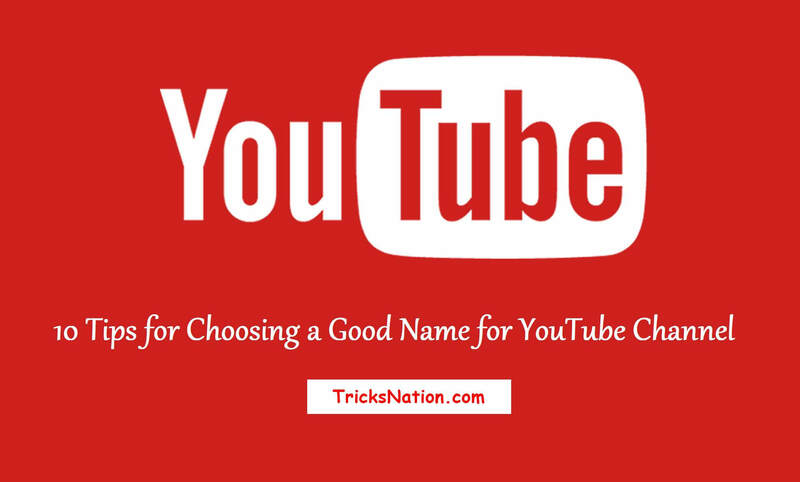 Here are the ways to choose a good name for the YouTube channel. You have to choose a YouTube channel name that is the best and the most different so that anyone who views your channel would like to watch your video and subscribe to the channel. Choosing a creative name, you have to choose a name for your YouTube channel that fits perfectly on your channel, so before choosing a name you can decide what kind of videos you upload on YouTube. If you want to make a comedy video then choose a funny name for your channel so that your channel is better for fun and comedy videos. As if you upload comedy videos on the channel named “Health Tips”, you cannot succeed but do not choose a name that is hard to speak and difficult to write. Channels with a name related to the content are becoming very popular today because the name of a word is easy to type and remember by the name of many words. The name of one word does not mean that you choose any word but choose the name that best fits your channel, and you have a meaning that is related to your video. Add two words related to your content, adding two words together can be a good name. There are many YouTube channels whose names are created by adding two words. Unless you choose a good name for your YouTube channel, no one will be attracted to your channel, so choose a name that is attracting people. Choose the name to explain the purpose of your channel, in order to become a Famous YouTuber, you have to decide what your channel will offer, what you are going to provide, who can not do anything else. Maybe you have comedy, funny, humorous, superb and some brand of web series or maybe you have such talent that is not in someone else. You can choose the name of your channel according to the purpose. The name of your channel should be related to your content (video), the relevant name is always more attractive. Your channel name tells your audience what your channel and video has. With a unique and relevant name, you can attract a lot of viewers if you want to make videos related to health, then you can choose “health tips” for your channel. Choose a famous name, think about your audience’s likes and popularity and choose a name that is popular everywhere, which can not be forgotten by reading and listening at a time. For example, if you are creating a channel on Astrology, then you can use words like the universe and galaxy, for example how well the names of the marvels and galaxies are. The word of mouth is the main role of any kind of success, to remember your audience and to recommend other people, the complicated name can be difficult. Choose a name that is easy to remember and remember so that people start discussing it, for example, cannot write and memorize names like “Cecchisdhus” and will not be able to tell anyone about it. Avoid using abusive or obscene jokes, I believe that you have the freedom to give a speech on YouTube but that does not mean that you use the wrong words and language. Many people use the wrong language in the video, even some people make their own channel with a derogatory name but it is all wrong with YouTube and its future is bad. By using the wrong words in the name of your username and channel, you are ignoring those people who do not like civilization, you ignore the bad name and choose a nice name for your channel. Many people choose the names of famous channels to choose their names, so that they copy paste those people, before making your YouTube channel name official, check that there is no channel under this name. You can find it by searching on Google and YouTube if your channel name matches any other channel, then you can choose another name for your channel so that you can get a separate identity. If you want to make your channel popular, it is important for a website or blog, but it is also important that the username is available. As you are creating a YouTube channel by weird name and its username is not available YouTube.com/funny, a lot of viewers go to the channel whose username is fun. Also, the name of your YouTube channel name should also be available so that you can create websites and blogs for your channel so that you can promote the site through the channel and the channel from the site. With the quality of your video, it is important to have the name of your channel good because people prefer the name of the channel more than the video, so choose a name that everyone likes and can tell their friends and other people. Choosing a name similar to the name of another channel is good. Choose the name which is the most different, your identity will be exactly the same as people wearing 100 red shirts have a person wearing a white shirt. Hopefully, you’ll find 10 tips to choose a good name for this YouTube channel in this post if you find it, then share them with your friends on social media.